Do young children belong in restaurants? 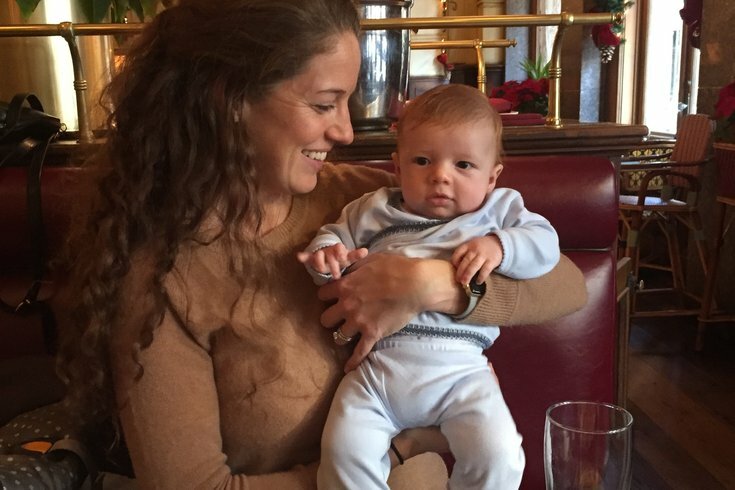 Katie and her baby have been going out to eat at restaurants since he was just a few months old. Before I became a parent, I did not understand why people would take babies to fancy restaurants. I get dining out with your kids at a family-friendly establishment that offers high chairs and a kids menu. But why take a baby to Rouge? Oh, how perspectives change when you become a mama! I have realized that the parents who take their babies and young children out to eat at nice restaurants were just like me: They simply wanted an excellent meal paired with a good glass of wine. Maybe they were really craving a Rouge burger! Baby on board: Is it a good idea to take a young child on a long flight? Wedding season with a baby: Is it appropriate to bring your children? Is it appropriate to take a baby or young child out to a nice restaurant? Some say no. But I say yes! One of my favorite restaurants is Steve & Cookie’s Restaurant and Oyster Bar in Margate, New Jersey. My young son has been there many times. The first was when he was just a few months old. My parents and I brought him into the restaurant in his baby carrier and requested a booth. The carrier fit on the seat next to me. After we ordered, he was picked up and passed around the table, spending most of the meal on our laps. He was a perfect angel, content to just hang with us while we had a nice dinner. Steve & Cookie’s has provided many wonderful evenings to my family and having Killian join us there for the first time was special. Dining out with family and friends is not just about the food but creating treasured memories together. Since that first time at Steve & Cookie’s, Killian has been to a number of restaurants, and so far, each time has been a success. My husband and I do not dine out as often as we did before we had a baby, but it is nice that we are occasionally able to go out as a family. Some people may think I am crazy for bringing my son along to a restaurant that does not have designated stroller parking or chicken fingers on the menu. But it works for us, and Killian always seems to enjoy it. There are people to look at, new sights and smells to take in, and sometimes there is even a piano player. Like everything in my life as a mother, he comes first, so it should go without saying that if my son did not like being in a restaurant, we would not go. If you want to dine out at your favorite restaurant with a baby or young child, the rules I follow may help. Based on my experience with my 9-month-old son, here are my recommendations to make dining out fun for the whole family. Our restaurant experiences have been successful largely because we time it right for our son and his schedule. If we tried to go out to breakfast when baby boy usually goes down for his morning nap, it would be a catastrophe. If we go out to lunch, we arrive between 11:30 a.m. and noon. We leave within an hour to ensure playtime before his afternoon nap. If we go out to dinner, we arrive between 5 and 6 p.m. and leave by 7 p.m. to get him home to bed. We feed him at the table while he sits in a high chair. It is really important to keep to your baby’s routine and not skip a nap or keep him out after his bedtime just so you can go out to eat. If you are dining with others, be sure to explain your time constraints; if they cannot be accommodated, then you should not go. Even though I have taken Killian to some pretty nice places, there are quite a few restaurants I would never take my son. Some places just aren’t right for babies! Don’t be the family who crowbars their little one into a situation that will not be appropriate or pleasant for him. Don’t be the parents who ruin everyone else’s evening because you set your child up for a meltdown. If you are not sure whether a restaurant will work for your family, call and ask if they have high chairs. It is the easiest way to determine whether or not they make accommodations for young children. No high chairs means do not take your baby. I take so much pride in being prepared and having everything my baby may need in my diaper bag. When we dine out, in addition to Killian’s food, bib and spoon, I bring a couple of small, non-noisy toys; a bottle filled with water; a pacifier; a blanket (restaurants can be cold); and an extra change of clothes (in the event of an accident). If you want to eat out but do not have the necessities for your little one, I recommend postponing or getting your meal to-go. If you go in unprepared, you are setting yourself up for failure. If you think you are ordering three courses when you dine out with a baby, think again. In order to make this a good experience, be prepared to order as soon as the waitress arrives. When we dine out, I know that we have a small window to have a good meal. Killian is at the point where he enjoys being in a high chair or on someone’s lap, but he starts to get fussy if he is cooped up too long. And a restaurant floor is no place to have your baby crawling around. So keep your meal short and sweet – and skip dessert. I have encountered two different kinds of people when we dine out: those who look at me as if I’m crazy (I get it; I used to be you!) and those who ohhhh and ahhhh over Killian. In life and dining out with a baby, politeness goes a long way: to the waitress who has to accommodate reaching over your child, to the patron sitting behind you who may not want their dinner to be accompanied by a chorus of "MAMA DADA"; to the hostess who says she has to put your stroller next to the dirty bucket and mop. When you are a parent with young kids, having a nice meal out is cause for celebration, so take it all in stride. Smile and say please and thank you to those you encounter. A parent knows their baby’s cues. Don’t turn a blind eye to the signs your little one is giving you because you want to hang a little longer. If we are at a restaurant and Killian becomes fussy, we ask for the check. It does not matter if I have not finished eating. At the first sign that Killian is over it, we are too. As he gets older, we will teach him patience and respectful behavior that will allow us to have a meal out without him dictating the terms. But while he is a baby, he is calling the shots. When he says it is time to go, we go. Do you take your baby to restaurants? Are you annoyed if there is a noisy little one at the table next to you? Any tips for making dining out a pleasurable experience for everyone? Share with me and other parents in the comments section below or tweet me @ThePhillyVoice and @KathleenEGagnon.